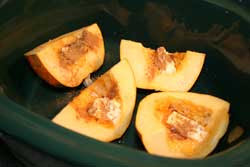 Several years ago, I found a technique for cooking acorn squash in the crockpot which I like to use if I need the oven for other foods. I have an oblong crockpot that can hold 4 quarters of an acorn squash side by side. When I think of fall, I think of squash – pumpkin, butternut, and of course acorn squash. Unfortunately, I’m the only person in my family who loves acorn squash which means I buy one acorn squash at a time and cook it, just for me. That’s not such a bad thing, is it? If you find the acorn squash hard to cut into quarters, putting it into the microwave for about 30 seconds on high softens the skin. Or you can skip that step and wrangle the very large kitchen knife through the skin. The acorn squash will split once you get the cut going with the knife. Personally, I prefer to wrangle. After cutting the acorn squash in quarters, place each one in the crockpot with the inside facing up. Fill the middle of the acorn squash with butter, brown sugar, and cinnamon. Using an oval crockpot, bake the acorn squash on low for 3 hours. You can also bake on high for 2 hours. I just bought a butternut squash whole for the first time and was wondering how I should cook it! I love acorn squash baked in the oven halved, but wasn’t sure if the butternut would work the same. Thanks for sharing! I haven’t seen a crockpot recipe for squash prepared this way before. I’m really pleased you shared this! What an easy way to prepare acorn squash! I love this -thanks for posting the recipe for it. I never knew that I could make Squash in the Crockpot.